Windows 10 is the newest member of the Microsoft Windows operating system line. Windows 10 introduces an updated Start Menu, new login methods, a better taskbar, a notification center, support for virtual desktops, the Edge browser and a host of other usability updates. Cortana, Microsoft's mobile personal assistant, is now part of Windows 10, even on desktop computers. Windows 10 was first code-named Threshold and was assumed to then be named Windows 9 but Microsoft decided to skip that number altogether. See What Happened to Windows 9? for more on that. The final version of Windows 10 was released to the public on July 29, 2015. Windows 10 was first released as a preview on October 1, 2014. Windows 10 was famously a free upgrade for Windows 7 and Windows 8 owners but that only lasted for one year, through July 29, 2016. See Where Can I Download Windows 10? for more information. Windows 10 succeeds Windows 8 and is currently the most recent version of Windows available. Windows 10 can be purchased directly from Microsoft or via retailers like Amazon.com. Several additional editions of Windows 10 are also available but not directly to consumers. Some of these include Windows 10 Mobile, Windows 10 Enterprise, Windows 10 Enterprise Mobile, and Windows 10 Education. Additionally, unless otherwise marked, all versions of Windows 10 that you purchase include both 32-bit and 64-bit editions. If you're upgrading from Windows 8 or Windows 7, make sure you've applied all the updates available for that version of Windows before starting the upgrade. This is done through Windows Update. The Start Menu in Windows 8 was a lot to deal with for a lot of people. Instead of a menu like the one seen in prior versions of Windows, the Start Menu in Windows 8 is full-screen and features live tiles. 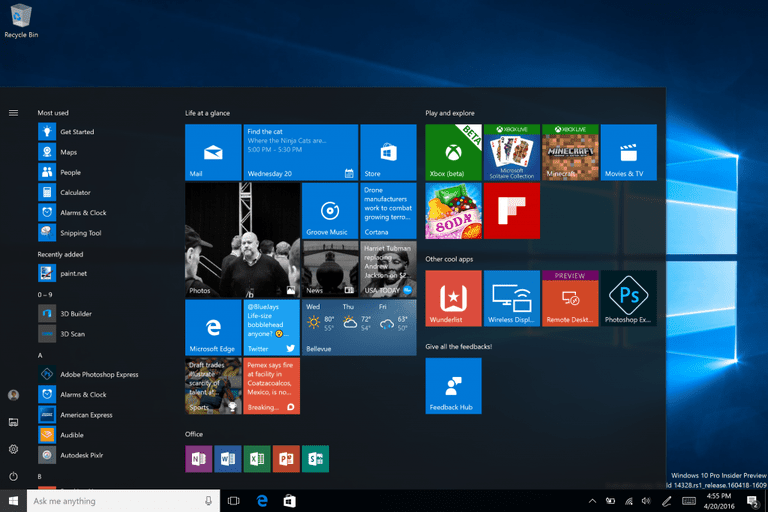 Windows 10 reverted back to a Windows 7-style Start Menu but also includes smaller tiles — the perfect mix of both. Partnering with the Ubuntu Linux organization Canonical, Microsoft included the Windows Subsystem for Linux in Windows 10, which is the command-line utility found on Linux operating systems (sometimes inaccurately called the Bash shell). This features allows some Linux software to run within Windows 10. Another new feature in Windows 10 is the ability to pin an app to all of the virtual desktops you have set up. This technique is useful for apps that you know you want easy access to in each virtual desktop. Windows 10 makes it easy to quickly see your calendar tasks by just clicking or tapping on the time and date on the task bar. It's directly integrated with the main Calendar app in Windows 10. There's also a central notification center in Windows 10, similar to the notification center common on mobile devices and other operating systems like macOS and Ubuntu. Overall, there are also tons of apps that support Windows 10. Be sure to check out the 10 best we've found.